HAN DYNASTY 220 - 206 BC created a lasting Han cultural identity among its populace that extends to the present day. The Han Dynasty expanded the empire's territory considerably with military campaigns reaching Korea, Vietnam, Mongolia and Central Asia, also helped establish the Silk Road in Central Asia. 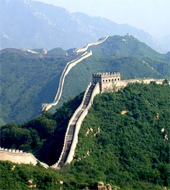 China was for a large part of the last two millennia the world's largest economy. However, in the later part of the Qing Dynasty, China's economic development began to slow and Europe's rapid development in the Industrial Revolution enabled it to surpass China. TANG AND SONG DYNASTIES Chinese technology and culture entered a golden age. The Tang Empire was at its height of power until the middle of the 8th century, when the An Shi Rebellion destroyed the prosperity of the empire. The Song Dynasty was the first government in world history to issue paper money and the first Chinese polity to establish a permanent standing navy. Between the 10th and 11th centuries, the population of China doubled in size. This growth came about through expanded rice cultivation in central and southern China, and the production of abundant food surpluses. 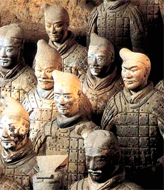 SONG DYNASTY The Northern Song Dynasty had a population of some 100 million people. The Song Dynasty was a culturally rich period for philosophy and the arts. Landscape art and portrait painting were brought to new levels of maturity and complexity after the Tang Dynasty, and social elites gathered to view art, share their own, and trade precious artworks. 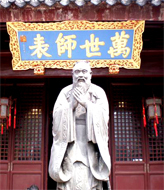 Philosophers such as Cheng Yiand Chu Hsi reinvigorated Confucianism with new commentary, infused Buddhist ideals, and emphasized a new organization of classic texts that brought about the core doctrine of Neo-Confucianism. YUAN DYNASTY In 1271, the Mongol leader and fifth Khagan of the Mongol Empire Kublai Khan established the Yuan Dynasty, with the last remnant of the Song Dynasty falling to the Yuan in 1279. Before the Mongol invasion, Chinese dynasties reportedly had approximately 120 million inhabitants; after the conquest was completed in 1279, the 1300 census reported roughly 60 million people. MING DYNASTY 1368 Under the Ming Dynasty, China enjoyed another golden age, developing one of the strongest navies in the world and a rich and prosperous economy amid a flourishing of art and culture. 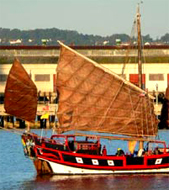 It was during this period that Zheng He led explorations throughout the world, reaching as far as Africa. In the early years of the Ming Dynasty, China's capital was moved from Nanjing to Beijing. During the Ming Dynasty, thinkers such as Wang Yangming further critiqued and expanded Neo-Confucianism with concepts ofindividualism and innate morality that would have tremendous impact on later Japanese thought. Chosun Korea also became a nominal vassal state of Ming China, and adopted much of its Neo-Confucian bureaucratic structure. In 1644, Beijing was sacked by a coalition of rebel forces led by Li Zicheng, a minor Ming official who led the peasant revolt. The last Ming Chongzhen Emperor committed suicide when the city fell. THE MANCHU QING DYNASTY then allied with Ming Dynasty general Wu Sangui and overthrew Li's short-lived Shun Dynasty, and subsequently seized control of Beijing, which became the new capital of the Qing Dynasty. In total, the Manchu conquest of China cost as many as 25 million lives. THE QING DYNASTY, which lasted until 1912, was the last imperial dynasty of China. In the 19th century, the Qing Dynasty adopted a defensive posture towards European imperialism, even though it engaged in an imperialistic expansion of its own into Central Asia. At this time, China awoke to the significance of the rest of the world, the West in particular. As China opened up to foreign trade and missionary activity, opium produced by British India was forced onto Qing China. Two Opium Wars with Britain weakened the Emperor's control. Western imperialism proved to be disastrous for China. SUN YAT-SEN FIRST PRESIDENT OF THE REPUBLIC CHINA 1 JANUARY 1912, was proclaimed provisional president of the republic. After 1916, China was politically fragmented, with an internationally recognized but virtually powerless national government seated in Beijing. This political division made it difficult for Chiang to battle the Communists, which the Kuomintang had been warring against since 1927 in the Chinese Civil War. MAO ZEDONG OCTOBER 1, 1949 proclaims the establishment of the People's Republic of China. 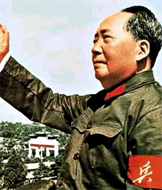 Mao encouraged population growth, and under his leadership the Chinese population almost doubled from around 550 million to over 900 million. In 1966, Mao and his allies launched the Cultural Revolution, which would last until Mao's death a decade later. After Mao's death in 1976 and the arrest of the Gang of Four, Deng Xiaoping quickly wrested power from Mao's anointed successor Hua Guofeng. Deng was in fact the Paramount Leader of China at that time, his influence within the Party led the country to significant economic reforms.